Unlike general anesthesia and intravenous sedation, nitrous oxide will not put you to sleep. It will, however, decrease your awareness of and sensation of what is occurring during your dental visit. Nitrous Oxide can do all of the following: reduce your anxiety level, enable you to feel more relaxed, and decrease your gag reflex. Most importantly, it raises the pain reaction threshold, making you more tolerable of the injection and other procedures that would usually feel uncomfortable. 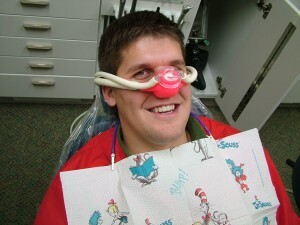 Nitrous oxide is a gas that is delivered through a nose mask. It is given simultaneously with Oxygen. Some refer to it as “laughing gas”. It has a quick onset of action. Patients often feel it working within a few minutes after inhalation. It is one of the safest forms of sedation and can be used on patients whose medical conditions (such as high blood pressure, asthma, etc.) might exclude them from other forms of sedation. It is eliminated from the body in as little as five minutes, thus making it possible for you to drive yourself home shortly after your appointment. Cavities are generally caused by the presence of bad bacteria in the mouth. They can also be caused by the foods and drinks that we consume. 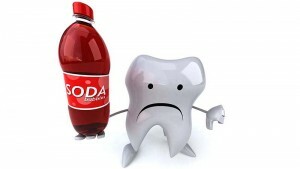 Soda, most definitely, can contribute to the development of caries. This is because soda is very acidic, and cavities can develop from low (acidic) pH levels. 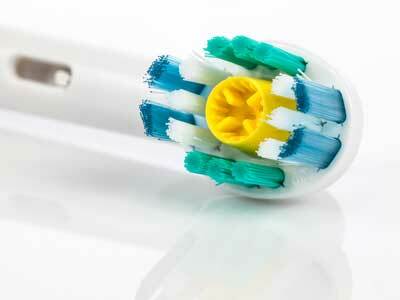 This is why brushing and flossing alone, will not prevent most cavities. It is important to watch what you eat and drink. Highly acidic foods and drinks cause the erosion of enamel and the formation of cavities. Foods and drinks such as candy, soda, wine, coffee and tea have low pH levels. Other foods such as bread, cheese, and milk have higher (more basic) pH levels and are less damaging to tooth structure. Tap water, in comparison, has an even higher pH level than these foods. There are some treatments that can protect your teeth and decrease the risk of cavities. Professional Fluoride treatments can guard against demineralization of tooth structure. Sealants can help as well. Sealants are protective tooth colored coatings that are placed in the grooves of the back teeth. These products are beneficial for children and adults. We have found that many patients present to us wanting to know the difference between a veneer and a crown and which one is right for them. Veneers are thin shells that cover the front of the teeth. They can be used to change the shape, color, size and length of a tooth and also to close gaps between the teeth. A crown is a thicker shell that covers all of the tooth surfaces. Crowns require removal of more natural tooth structure than veneers. Crowns are suitable for a wide range of clinical situations. Veneers, however, are not the best choice for patients who grind or clench their teeth or for patients whose teeth exhibit decay, large fillings, and lack of enamel. Additionally, veneers are not always appropriate when the teeth are not in the proper position and orientation. But when used in the right clinical setting, they can be a highly esthetic, more conservative treatment option. A comprehensive evaluation by your dentist will determine which option is best for you. If your child plays a contact sport such as soccer, football, hockey, or basketball, they most likely wear protective gear such as helmets, kneepads, shoulder pads, etc to protect their head, neck, limbs and joints. Mouthguards, which can protect the teeth, lips, and other parts of the mouth, are just as important as the more common types of gear. Unfortunately, we see a fair number of kids each year in our practice who have suffered trauma to their teeth and mouth, that could have been prevented by wearing a mouthguard. Sometimes these teeth need large fillings, root canals, and periodic evaluation to monitor for infection and abscesses which may not arise immediately following the accident. Having a custom mouthguard made involves taking an impression or mould of the teeth which is then used by a dental lab to make a guard that fits the teeth exactly. We show you and your child how to clean and care for it and ask that you bring it in at all recall appointments so that we can check for wear and tear and make any needed adjustments. Do not touch the root of the tooth (which is the long tapered part). Touch only the crown. Place the tooth in cold milk so that it does not dry out. Go to the dentist immediately so that the tooth can be replanted. If you notice that you have a decrease in the amount of saliva in your mouth, you may have a condition known as dry mouth. It usually causes one to feel discomfort and to have difficulty swallowing, chewing, etc. You may also feel that your tongue is rough and dry and that your throat feels parched. Occasionally you may develop mouth sores. Often, we notice that over time, a dry mouth can result in greater incidence of tooth decay. The condition may be caused by certain medications such as those used to treat high blood pressure and depression. It can also be caused by medical treatments such as radiation and chemotherapy. There are some diseases that affect the salivary glands. Sjogren’s syndrome, HIV, and diabetes have all been found to cause dry mouth. Let your physican and/or dentist know if you are experiencing dry mouth so that they can determine the cause. Your physician or dentist can prescribe a medicine that can help your salivary glands to function better. They may also recommend artificial saliva. Decrease intake of caffeinated beverages that are known to dehydrate. This includes coffee, tea, and soda. Chew sugarfree gum which helps increase saliva flow. Avoid tobacco and alcohol which dry the mouth. Try especially to avoid mouthwashes that contain alcohol. Use a humidifier in the home particularly at night. Did you know that those with good oral health may have better overall health? How so? Well, studies suggest that patients with periodontitis (which is untreated gingivitis that transitions into ongoing inflammation ) may be at higher risk for heart disease and stroke. Pregnant women with gum disease may be more prone to pregnancy diabetes, premature birth, and low birth weight babies. Use Fluoride to strengthen your baby’s teeth. You may need to find out if your drinking water, whether well water, tap or bottled, is adequately fluoridated. Begin cleaning your baby’s teeth once they come in. Use a soft cloth or baby toothbrush. Around age 2, it is okay to begin using a pea size drop of toothpaste. 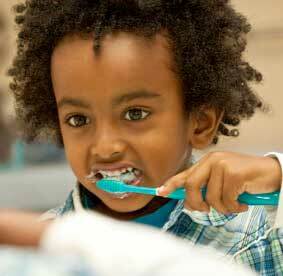 If you don’t brush properly, plaque can be left on your teeth which can sometimes lead to gum problems and cavities. Even with instruction from your dentist and hygienist, you may still not be able to clean your teeth adequately. It’s that time of year again! Time to listen to your little ones politely asking for chocolate bunnies and excitedly giggling as they search for hidden eggs. 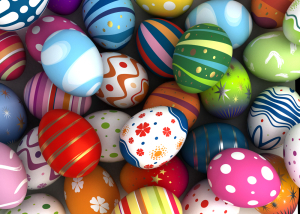 Whether you are simply tired of dying and hiding eggs at home or if you love a good community egg hunt, head over to South Park for some family fun festivities. Patients dealing with tooth loss may move through a wide range of emotions within a single day. You may first feel embarrassed by the appearance of your smile, which may negatively affect your confidence. In addition, you may come up against tasks that you once completed with ease, such as speaking or chewing, only to find that you feel challenged and frustrated. Rather than wait another moment attempting to deal with the open spaces in your mouth, we invite you to learn more about dental bridges to discover whether they may offer you the complete smile you deserve.